Honey Grove, TX—After receiving a letter from First Liberty Institute, Honey Grove (TX) Independent School District officials reversed a decision that forced students praying together to hide behind a cafeteria curtain, move to an empty gym, or relocate outside to pray. 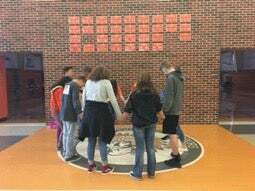 In early September, Hannah Allen and a group of other students at Honey Grove Middle School prayed together during lunch for one of their former classmates who had recently been in an accident. Their principal told them they needed to stop. No school officials were involved with the prayers. When Hannah and her friends decided to continue their prayers during lunch the next day, the principal told them they had to move behind a curtain in the cafeteria, remove themselves to the gym, or meet alone outside. In its letter to school officials, First Liberty explained that student led prayer during non-instructional periods of the school day is squarely protected by the U.S. Constitution and offered to assist the District to conform the school’s policies on student religious expression to the guidelines established by the U.S. Department of Education on the subject.